Heat oven to 350°F (325°F for dark or nonstick pans). Grease bottoms only of two 8- or 9-inch round cake pans with shortening (do not use cooking spray). Make, bake and cool cake as directed on box for 8- or 9-inch rounds. Refrigerate layers 45 minutes for easier handling. Meanwhile, in large bowl, beat cream cheese, milk and 1 tablespoon lemon peel with electric mixer on low speed until smooth. Beat in whipping cream and powdered sugar. Beat on high speed, scraping bowl occasionally, until stiff peaks form. Slice each cake layer in half horizontally to make a total of 4 layers. (To cut, mark side of cake with toothpicks and cut with long, thin knife.) Fill each layer with 1/2 cup whipped cream mixture. Frost side and top of cake with remaining whipped cream mixture. Garnish with additional lemon twist. Store covered in refrigerator. If softening cream cheese in the microwave, transfer to a chilled bowl and continue as directed in step 3. 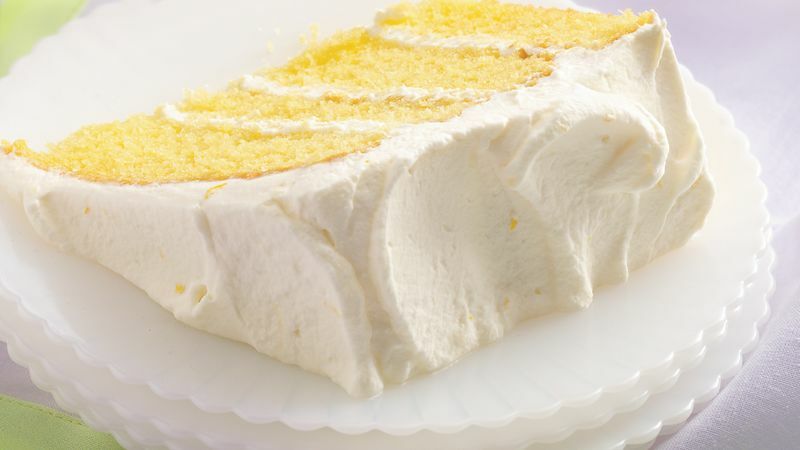 For a quick frosting, stir 2 teaspoons grated lemon peel into each of 2 containers (12 oz each) Betty Crocker® Whipped whipped cream frosting. Create a Citrus Velvet Cream Cake by substituting orange peel for the lemon peel and garnishing top of cake with mandarin orange segments.